Great helicopter but this one is a kit so you need to be serious about the hobby before you undertake this project. I successfully put this thing together and it flys beautifully so I am proof that anyone can succeed (I'm a programmer, I don't do hardware). I'll outline the steps I followed in assembling this kit and, hopefully, help you to avoid some of the pitfalls I ran into. By the way, I highly recommend Bob White's (AKA Finless) videos on the basics of RC helicopters, they contain a wealth of useful information. When you purchase the kit you will discover that part of the reason it's so cheap is there are no electronics as part of the kit: servos, ESC (Electronic Speed Control), motor, gyro - they are all separate. Fortunately, whoever you get the kit from will also offer an electonics package. If you're new I would recommend getting the package. If you're experienced enough to know which trade offs to make you can buy individual parts but the package will be more than sufficient for most people. Pro tip. The electronics package will not include a receiver. Turns out receivers from one manufacturer will not necessarily work with transmitters from a different manufacturer so you have to get a reciever that will work with your transmitter. Since I started with Walkera I have a Devo-7 transmitter so I just went out and got a Walkera Rx-601 receiver, it has enough channels and works with my Devo-7. Be careful when buying replacement parts. The issue is that you might find that your favorite suppliers are all out of CopterX specific parts so the obvious sulution is to go with Align. 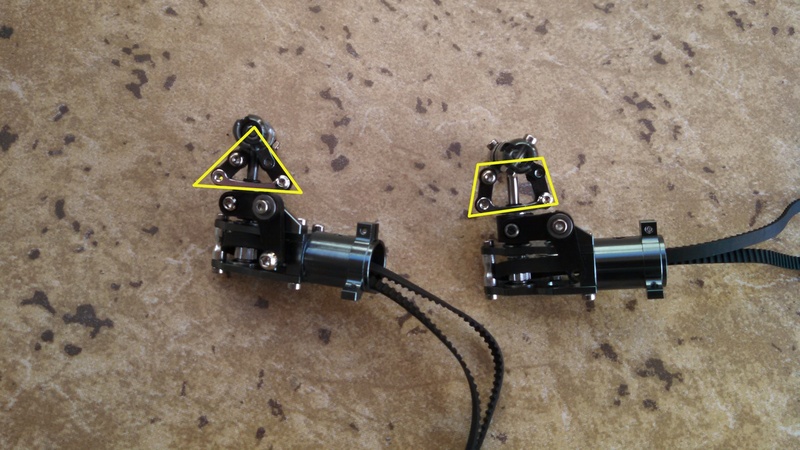 Since the CoperX 450 is an almost exact duplicate of the Align T-Rex 450 the parts should be interchangeable. The operative word in that last sentence is almost. Many parts are interchangeable, some others aren't. 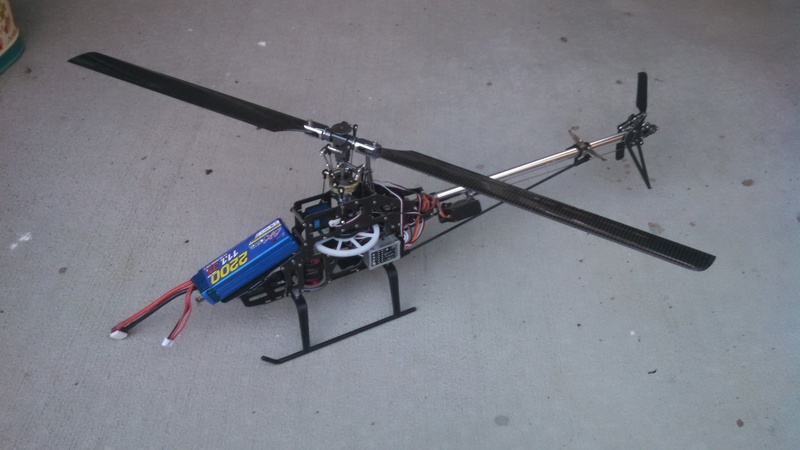 I bent the tail boom and all my suppliers were out of stock on the CopterX part. Got the Align tail boom and it fit perfectly, no problem. I broke a linkage on the tail rotor and, again, everyone was out of stock so I got the Align version of the same part. The linkages seemed to fit except the tail servo would lockup when I tried to adjust the servo (I thought the problems were because things got misaligned due to the crash). I spend days adjusting the servo horn and moving the servo back and forth on the boom trying to get it to work properly. Finally I got a new tail unit and this picture will show the difference between the two. Notice how, in the left picture, the linkages from the blade holder and the rudder control arm form a triangle (outlined in yellow) while in the right picture those same linkages form a trapezoid (outlined in yellow). Trepezoid = good, triangle = bad. If you have a triangle (caused by the Align parts being about a millimeter shorter) the linkages lock up when the rudder control arm tries to move out. Bottom line, be careful when buying alternative parts. They may work, they may not. Caveat emptor definitely applies.